It has been hard to see beauty in this city recently, but I discovered some thanks to Millfields Community School‘s Democracy Week. 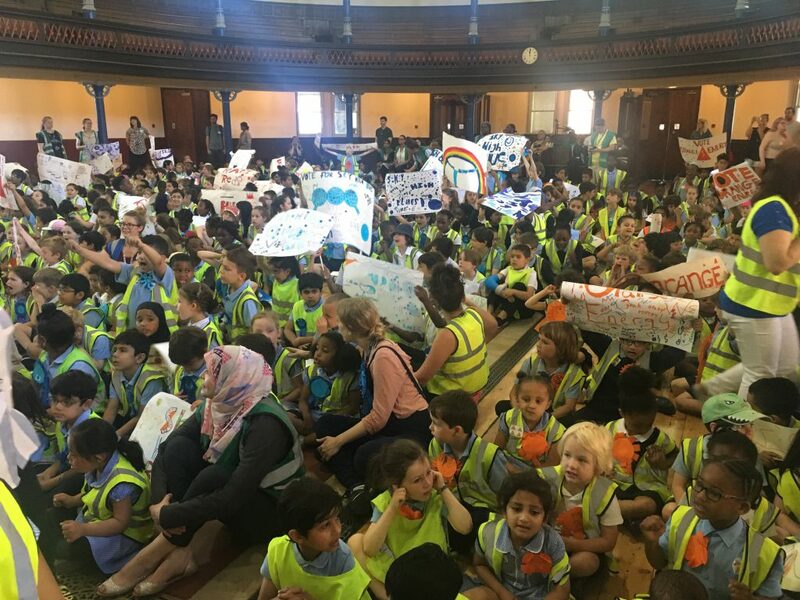 Children from the Hackney primary formed parties, wrote manifestos, conducted campaigns, took part in hustings and finally voted for a school Prime Minister. I’ve had a long association with Millfields – all but the eldest of my six children were educated there, covering a 20-year period. It has been my pleasure to report on a Millfields Democracy Week before. Covering the latest one lifted my spirits no end. A march with the young students and their staff down the busy, cosmopolitan Lower Clapton Road to the Round Chapel, a restored building where the hustings took place, captured perfectly the enthusiasm, effort and excitement of the project. Supporters of the five parties – Orange Energy, Rapping Reds, Green is Greater, Sky High Blues and Peaceful Power, sometimes known as Purple Power – carried school-made banners, chanted, sang and promoted competing proposals for raising money for the school, enhancing the environment and improving pupils’ health. There was a strong cross-party accord that approaching government cuts to school budgets should be opposed. In the chapel building, strong speeches were made to clamorous applause from a thronging junior electorate. On the press benches I made the acquaintance of a girl called Oasis, one of a team of reporters which produced an impressive four-page election bulletin on each day of Democracy Week. She was an excellent colleague. From the then latest edition of More From Millfields I learned that there had been press conferences, opinion polls (“remember, opinion polls aren’t always right”), cartoons and Q&As with teachers. Shockingly, it was disclosed that some campaign posters had been ripped from classroom walls and replaced by those of other parties (“Poster War”, 14/6/2017). Voting got underway that afternoon in the dinner hall of the Victorian school building, polling booths, stubby bits of pencil and all. Electoral rules forbade pupils voting for the party of which they were a member. Results were announced at a ceremony held in the playground the following morning. All participants in the process were thanked. Impressively, there were no boos for the spin doctors. Then came the outcome. The party with the highest number of votes was Green is Greater whose leader, a lovely boy called Solly, was literally moved to such tears of joy that he struggled to deliver his victory speech. He will make a fine Prime Minister. Reflecting a constitutional change from 2015, the leader of the party with the second highest number of votes, a charming child called Suki who led the Rapping Reds, was named Deputy Prime Minister. She too burst into tears and couldn’t get all her words out. By then, half the onlooking adults were snuffling too, or else finding specks of dust in their eyes. Elbowing my way through crowds of well-wishers, I managed to grab a few words with the two elected representatives who will forge an impressive consensus coalition. Solly said, “I am extremely happy,” and by then he looked it. Suki described herself as “emotional and excited”. What a pro. And what a beautiful thing Democracy Week was. Turnout was 641. Only six ballot papers were spoiled.